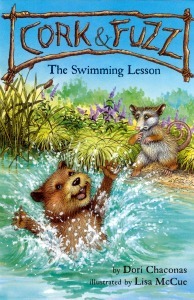 Flap copy: Cork is a short muskrat who loves to swim. Fuzz is a tall possum who's afraid of water. Cork wants to teach Fuzz how to swim, but Fuzz does not want to learn. Once the lesson begins, will Fuzz sink or swim? Best friends Cork and Fuzz are sure to delight beginning readers in their seventh sweet and funny adventure. Possum Fuzz and muskrat Cork are at odds over Fuzz’s reluctance to visit Cork’s house “in the middle of a pond” in this early-reader series entry. Cork offers to teach Fuzz how to swim, but after a lesson on land pretending to paddle through tickly grasses, Fuzz declares, “Swimming is not a possum thing to do.” He decides to climb out on a branch over the pond to jump down on Cork’s house, and Cork can barely watch as Fuzz gingerly makes his way along the branch—which ends up being a bit short. Startled by a bird, Fuzz falls into the water. Cork immediately dives in, and, in controlled text that ingeniously repeats words introduced earlier, he implores his friend to “paddle” and “kick.” Safe and sound at book’s end, the friends delight in Fuzz’s swimming skills as Cork mulls over an offer of tree-climbing lessons. Throughout, Chaconas expertly controls and repeats vocabulary, delivering a tightly paced, engaging story arc over four brief chapters. McCue’s accompanying illustrations, reminiscent of Garth Williams’ use of line to create visual texture, strike a fine balance between echoing key textual events and terms and extending the narrative. Opposites attract, but can they remain friends? In this latest installment of the friends’ adventures, Cork (a muskrat) realizes that Fuzz (a possum) has never been to his house. “‘I cannot go to your house,’ [Fuzz] said. ‘I do not know how to swim.’” Eager to overcome this obstacle, Cork gives a noticeably fearful Fuzz lessons by simulating swimming on the ground. Still afraid, Fuzz decides to climb a tree and “jump down right on top of your house.” Fuzz falls in the water and, after a moment of panic, swims to Cork ’s. He then vows to turn the tables by teaching Cork to climb. Although muskrats don’t typically climb and possums don’t jump, Chaconas is clearly using these animals as stand-ins for children reluctant to take chances. But don’t be too hard on her science; frogs and toads don’t make chocolate-chip cookies, either (Frog and Toad Together, rev. 6/72). Sentence wraps indicate a book for those beginning readers with some experience; the preponderance of sight words eases the task. McCue’s happy-go-lucky characters receive a lot of visual face time, showing both the action and the bond between the two.